Heat oven to 325°F. Spray 2 1/2-quart oval casserole with cooking spray. In 12-inch skillet, heat oil over medium heat. Add onion; cook 18 to 22 minutes, stirring frequently, until very soft and caramelized. In 2-quart saucepan, heat whipping cream, garlic, salt, pepper and thyme sprigs to simmering over medium-high heat. Reduce heat; cover and simmer 10 minutes, stirring occasionally. Uncover and simmer 5 minutes longer, stirring occasionally. Set aside. Layer one-fourth of the sliced potatoes in bottom of casserole. Top with one-third of the caramelized onions and 1/4 cup of the shredded cheese. Repeat layers two more times. Top with remaining potatoes. Strain cream mixture, and pour evenly over potatoes. Sprinkle remaining 1/2 cup cheese on top. Bake uncovered 1 hour to 1 hour 10 minutes or until potatoes are tender and mixture is bubbling and browned on top. Cool 10 minutes. Sprinkle with 1 teaspoon chopped fresh thyme leaves before serving. 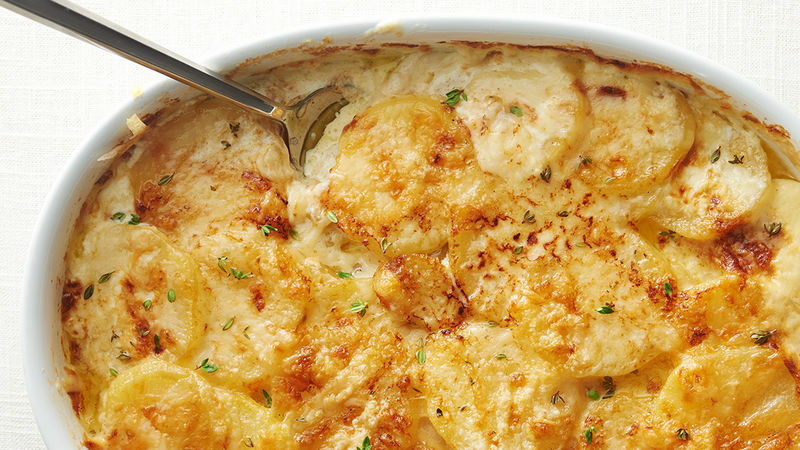 Swap Yukon Gold potatoes for russet potatoes, if desired. Use a mandoline slicer to thinly and uniformly slice potatoes, if desired.